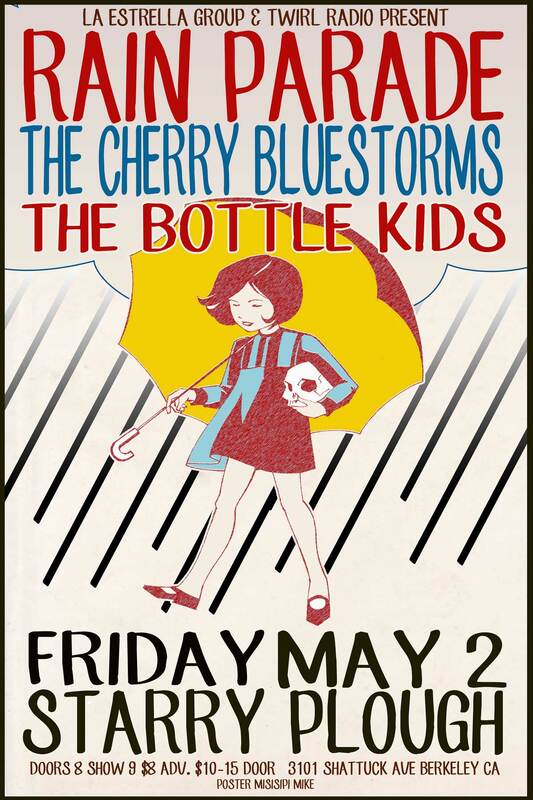 A Psych-Pop Social: The Rain Parade, The Cherry Bluestorms, The Bottle Kids, 5/2/2014, The Starry Plough, Berkeley, CA! La Estrella Group & Twirl Radio are pleased to present a not-to-be missed psych-pop social at The Starry Plough May 2. Headlining the show are the moody and magnetic pied pipers of the Paisley Underground, Rain Parade, with a delightfully rare & exclusive local appearance. Opening the show are The Cherry Bluestorms (LA) & The Bottle Kids offering up two generous portions of old school, West Coast power pop—with no skimping on the tight harmonies, sing-along melodies or driving hooks. Grab a date and your dancing shoes for an indulgent neighborhood night with the best of the scene. Twirl Radio Playlist – Show #637 – 4/26/2014: Interviews with The Cherry Bluestorms and The Bottle Kids! Twirl Radio Playlist – Show #635 – 4/12/2014: Peter Renzullo interview!